Rob’s career spans 30 years in the nuclear industry. His experience includes Nuclear Operations and Training as a Manager, Lead Auditor, Instructor, Training Developer, and Nuclear Operator. He has instructed Operations staff in advanced station systems and science fundamentals. He has led and supported audits across OPG’s nuclear fleet and internationally at Southern California Edison’s San Onofre nuclear power plant. In 2015, Rob was Operations Representative in Operations Control Center during Darlington’s Vacuum Building Outage. Rob has co-authored a technical document as a consultant to the IAEA in Vienna and presented papers on human performance and use of neurofeedback for enhancing human performance of Nuclear Operators at American Nuclear Society and Canadian Nuclear Society conferences. 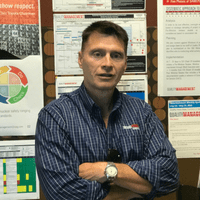 Recently, Rob has introduced major improvements to the Quality Management process for Darlington Refurbishment by developing and instituting the SAWLPO Model.